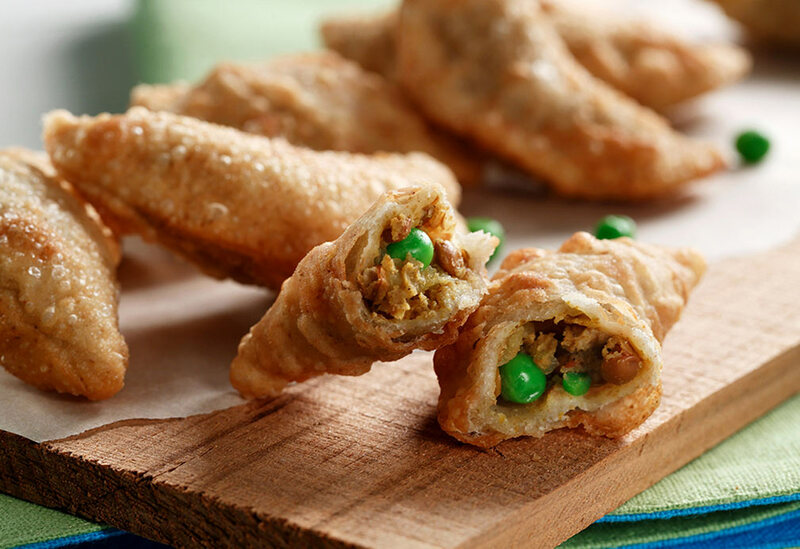 Samosas can be found in many East Indian and African cuisine, particularly along the area's coastal regions. 1. In skillet, over medium heat, add canola oil, onion, garlic, curry powder, cumin, chili flakes and cook for 1 minute, stirring. (Note: For extra spicy samosas, increase curry and add cayenne pepper to taste.) Add lentils, cook, and continue stirring for 2 minutes; add potatoes, peas, and water, bring to a boil, reduce heat, and simmer, covered 20 minutes or until potatoes are tender. Blend flour with second amount of water, add to mixture, and stir until mixture boils and thickens. Cool to room temperature before using. 2. To make pastry, sift flour into bowl, stir in canola oil, and cumin, gradually stir in enough water to mix to form dough. Knead on lightly floured surface about 5 minutes or until smooth. Cover, let stand 10 minutes. Divide pastry in half, roll each half to 1/8 inch (3 mm) thickness. Cut into rounds/squares using 3.5 inches (9 cm) cutter. 3. Place 1 tsp (5 mL) of filling into center of each round, brush edges of pastry lightly with water and fold in half. Press edges together with thumb and finger. Repeat with remaining pastry and filling. Deep fry samosas a few at a time until golden brown (about one to two minutes); drain on paper towel. For extra spicy samosas, increase curry and add cayenne pepper to taste. 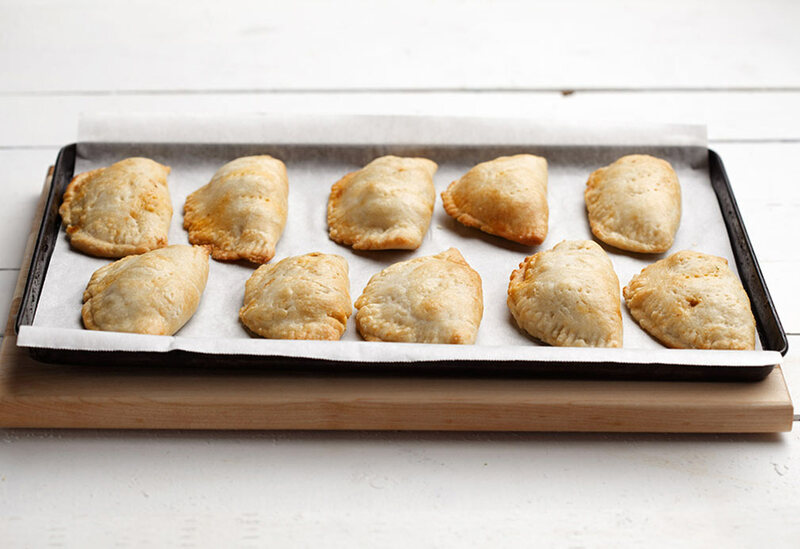 Try baked empanadas as an alternative to the traditional deep-fried version. 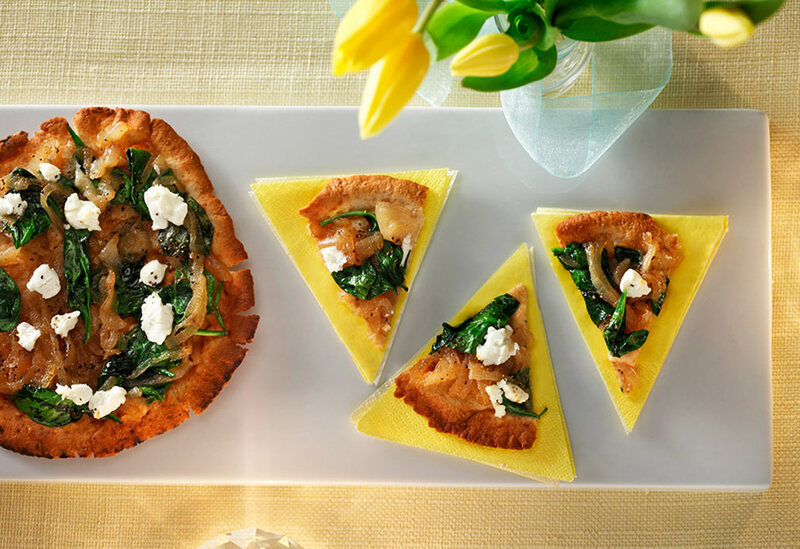 Caramelized onions are slow food at its very best and here make a glorious base for these rustic yet elegant pita pizzas topped with creamy goat cheese. These mini-pizzas will inspire children to eat vegetables! 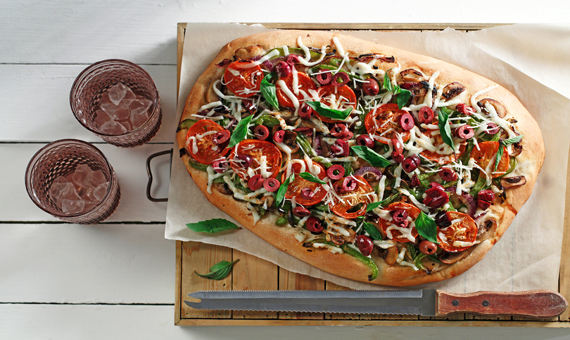 The canola oil browns the vegetables, brings out their rich flavors, and gives the dough a crispy crust.